Don't create a problem for yourself over copyright infringement. Podcasts consist of multimedia files recorded and offered through Web syndication. Podcast files are available for download and can be played back on a mobile device or computer; some can also be streamed from a hosting site for listening over the Web. 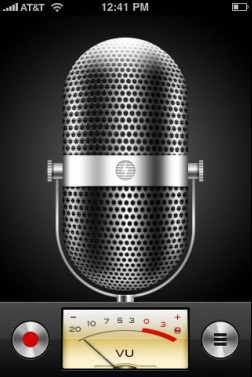 Generally the term ‘podcasting’ is used for audio files, while ‘vodcasting’ is used for video. Some radio shows offer podcasts in which each ‘episode’ becomes available for downloading after broadcast; likewise other organizations or individuals may offer podcasts in a downloadable series, such as a sequence of audio lectures from an instructor with each new audio lecture becoming available for download after each class session. If you subscribe to an ongoing podcast, each subsequent audiofile in the series can be downloaded to you automatically when it becomes available. For a short YouTube video that explains podcast basics, see Commoncraft’s Podcasting in Plain English by Lee Lefever. Finding PodcastsYou can find podcasts on most sites that deal in broadcasts. For example, National Public Radio (NPR), BBC, and CNN each have a portion of their sites dedicated to podcasts. If you already know who produced the podcast that you want, simply go to that site and look for it. For example, if you like National Public Radio programs and want to see if there are any that are available as podcasts, go to http://www.npr.org. The NPR Site lists podcasts by subject. If you want to download it to your podcatcher or aggregator or listen to it on your computer you can do that. There are other ways to find podcasts. You can also search sites such as PodcastAlley , http://www.podcastalley.com/. PodcastAlleyallows searching by keyword or browsing by subject. Once you find a podcast that you like, you can add the URL to your aggregator and listen to it later. You can also use a podcast database that allows you to listen to the podcast immediately without subscribing. One is called Podcast Pickle , http://www.podcastpickle.com/. You simply search or browse for a podcast to listen to, click on its title, and immediately you can listen to any episode that is listed. When you ‘catch’ a podcast you are subscribing to an RSS feed. That means you’ll be giving a URL to the podcatcher or aggregator to represent the podcast. Then the aggregator contacts the site that hosts the feed, you get a list of episodes or podcasts to listen to and review, and the aggregator software keeps the list of podcasts up to date. For example, the URL for the podcast the NPR Business Story of the Day is http://www.npr.org/rss/podcast.php?id=1095. checks and collects for you any newly posted blogging or news text content that you have subscribed to, except that instead of reading new blog posts or news items in your RSS feed reader or aggregator, the podcasting software downloads new audiofiles from your subscribed feeds. Examples of popular podcast reader software (or “podcatchers”) used for subscribing to and listening to podcasts include Apple’s iTunes and Juice (formerly iPodder). To compare software, see Podcatcher Matrix. For podcast creators, or “podcasters,” the process involves first recording an audiofile (typically in .mp3 format) and then loading the audiofile to an online hosting location. To make audiofiles ‘downloadable’ for podcast listeners, the podcaster must also create a web page in rss format listing all audiofiles in the series that are currently available to be downloaded. Each time a new audiofile is added, the podcaster must update the rss.xml file which contains the list of audio files to add in each new uploaded recording. When a subscriber’s podcatcher software later checks for updates to the podcaster’s rss.xml file and finds a new audio file on the list, the podcatcher software automatically follows pointers in the rss.xml file to download the new audio file. (See Danny Sullivan’s guide on creating an rss.xml file for podcasters at Searchenginewatch.com and Apple iTunes example rss feed; note that iTunes uses some special tags.) Feed Validator can be used in checking for and fixing any problems with your rss.xml file. The last step is making the podcast ‘findable,’ for example by getting it listed in a directory of podcasts or in a site such as iTunes where listeners might more easily be able to find and subscribe to it. Each directory or listing site will have different instructions for submitting a podcast to be listed; in iTunes, for example, submitting a podcast is done by providing the rss.xml file link to the iTunes Store. Go to Podcatcher Matrix and view some of the differences between iTunes and Juice. Go to Podcast Pickle, find and listen to a podcast that deals with small businesses. Listen to more than one podcast in a series. If you have an iTunes account then start iTunes and find podcasts that deal with small businesses.